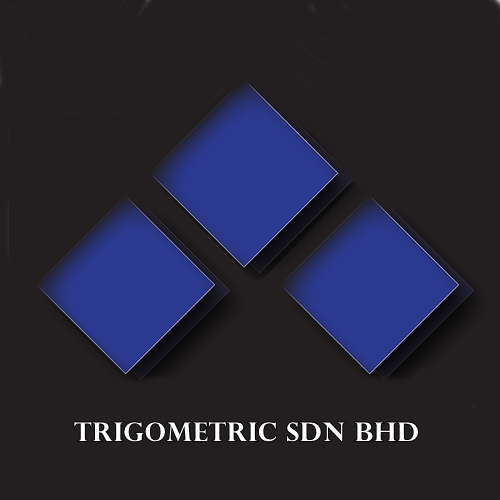 TRIGOMETRIC SDN BHD is a numismatic shop based in Malaysia. Trigometric also conducts Auctions for all numismatic & philatelic items. They have a wide variety of selections, focussing mainly on Malaysia's Banknotes. Trigometric held 2 live auctions a year, normally in March and October every year. They also organises an International Numismatic Fair (March) once every year in Malaysia. 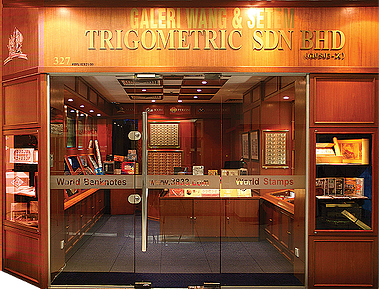 Trigometric retail offer the widest range of numismatic stock available in Malaysia from almost all over the world. They're the leading official authorised PMG & NGC member in Malaysia. Trigometric also publishes Numismatic Reference books written by KN Boon, founder of Trigometric Sdn Bhd; 8th Edition Malaysia, Brunei & Singapore Numismatic Reference (1786-2016) & 2nd Edition of Hong Kong & Macau Numismatic Reference (1846-2017). The books are updated every 2 years. A China-Taiwan Bank of Taiwan 5 Yen ND 1904 (P-1912) banknote with a serial no. 492494 is among the highlights of Malaysia and world banknotes & coins auction by Trigometric Sdn Bhd on 16 March 2016. The Bank of Taiwan-5 Gold Yen banknote is in F-VF Rust condition with a starting price of MYR16,000 (US$3,590). 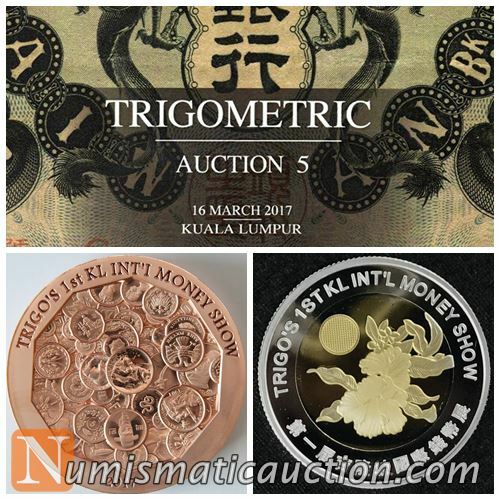 Trigometric Auction 5 will be held on Thursday, 16 March 2017 at Hilton Hotel Petaling Jaya, (P.J. Hilton), Serunai Suite 1 & 2 Level 1, East Wing, Petaling Jaya, Selangor. The gold Yen banknote issued in Yen as opposed to Yuan because it was issued at the height of Japanese Occupation of Taiwan. The gold Yen baknote were only issued from 1904-1906 in 1, 5, and 10 Yen denominations. 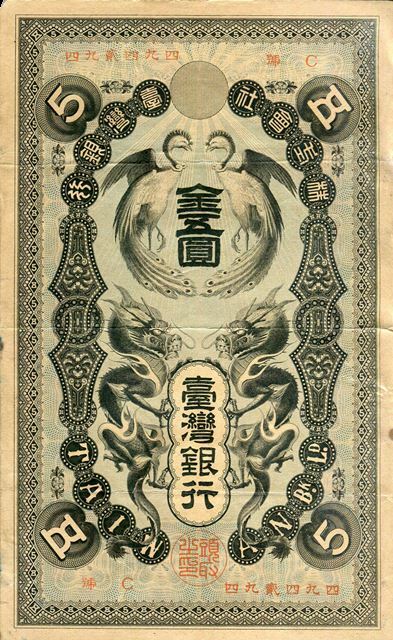 The banknote engraved in black, red and yellow on buff paper with exquisitely drawn peacocks, dragons and myriad ornamental designs. 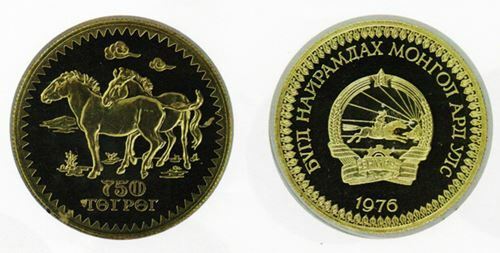 Another main highlight for the auction is (Lot 43) 1976 Mongolia Conservation of Wildlife UNC single gold 750 Tugrik (0.900 gold) featuring Przewalski Horses. Przewalski's horse or Dzungarian horse, is a rare and endangered subspecies of wild horse native to the steppes of central Asia. 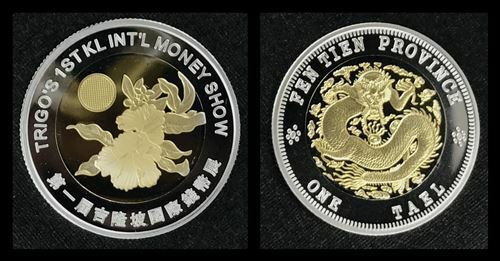 The coin mintage is only 929 pieces and without a certificate. The coin is estimate to sell for RM7,000-RM10,000 (US$1,573-US$2,248). A 2003 Malaysia Langkawi International Maritime & Aerospace (KN35) Proof set of 3 (lot no. 136) with certificate no. 028 will be estimate to sell for RM6,000-RM8,000 (US$1,348-US$1,800). 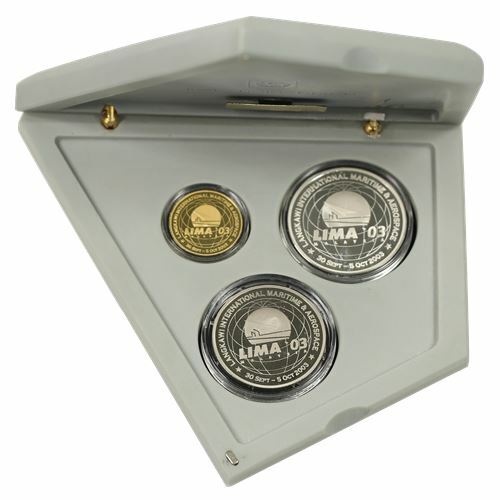 The 3 coin sets consist of RM1 (Copper Nickel), RM10 (.925 Silver) and RM100 (999.9 Gold). For record, only 100 set Langkawi International Maritime & Aerospace (LIMA) Proof set of 3 issued by Bank Negara Malaysia in 2003. A green 1940 Board of Commissioners of Currency Malaya $1 Dollar banknote (lot no. 590) with serial number A/8 056967 graded PMG 20 NET is another main highlight of the auction. The rare banknote is estimate to sell for RM30,000-RM40,000 (US$6,744-US$8,992). 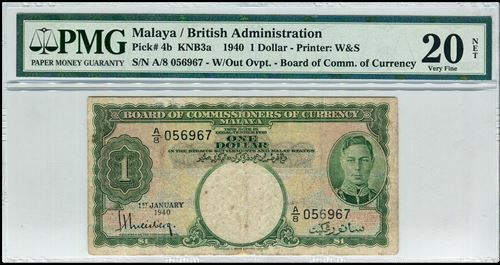 In 1939, The Board of Commissioners of Currency Malaya has commissioned Waterlow and Sons to design and print a new set of bank notes for Straits Settlements and Malaya with the portrait of King George 6th. A proofs set of $1 in Green, $5 in Blue and $10 in Purple were accepted. The banknote were printed with banknote date of issue on 1st January 1940. Some of the $10 (purple) banknote were shipped to Malaya and issued to the general public. The $1 and $5 bank notes were being shipped separately to British Malaya by the merchantman Automedon but were lost on 11th. November, 1940 to the German raider Atlantis in the Indian Ocean. The bank notes were sent to Japan. Subsequently, a few bank notes were apparently issued by the Japanese during their occupation of Malaya. 660 lots of world banknotes, world coins and stamps will be available for bidding in Malaysia and world banknotes & coins auction by Trigometric Sdn Bhd on 16 March 2016. You can download Trigometric Auction 5 catalogue here; Trigometric Auction 5 Catalogue (PDF). 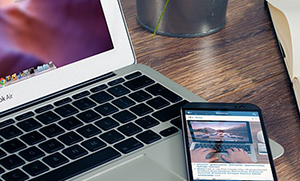 Buyer premium is 15% for floor bid and 20% for liveauctioneers.com internet bidding. You can pay using cash or credit card but the charges for credit card is 3%. You also need to add 6% GST for the buyer premium. For the 1st time, Trigometric Sdn Bhd will held their 1st money show, "Trigo Kuala Lumpur International Money Show" starting from 17 until 19 March 2017 at the same venue. 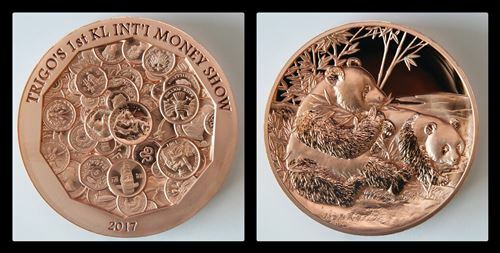 Two special medallion will be minted to commemorate Trigometric's Inaugural Money Show. * Price NOT INCLUSIVE 6% GST and postage. Pre-order for the medallions are available now, you can contact Trigometric Sdn Bhd for pre-order and detail information. 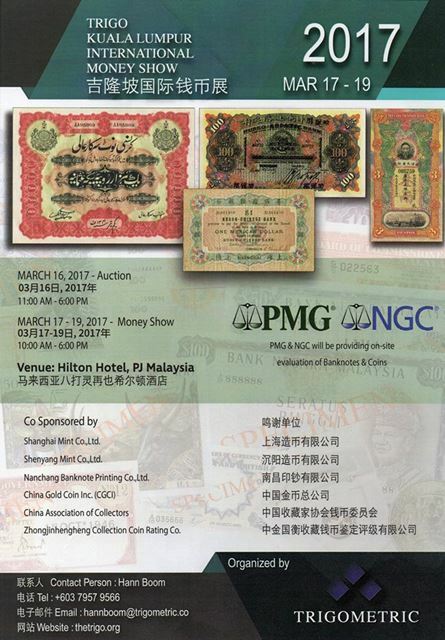 Paper Money Guaranty (PMG) and Numismatic Guaranty Corporation (NGC) will be providing free on-site evaluation of banknotes & coins for 2017 Trigo Kuala Lumpur International Money Show visitor. The latest 2nd Edition of Hong Kong & Macau Numismatic Reference book will also be released during "Trigo Kuala Lumpur International Money Show". 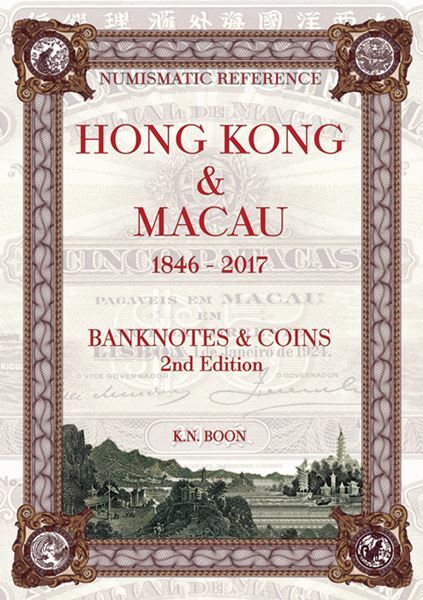 The 1st edition Hong Kong & Macau Numismatic Reference book issued in 2014. The latest 2nd edition will include all the latest currency from Hong Kong & Macau to date. The biggest update for the book will be the coins section, they previously have chose to left that out. ​Pre-order for the new book is available now, you can contact Trigometric Sdn Bhd for pre-order and detail information. 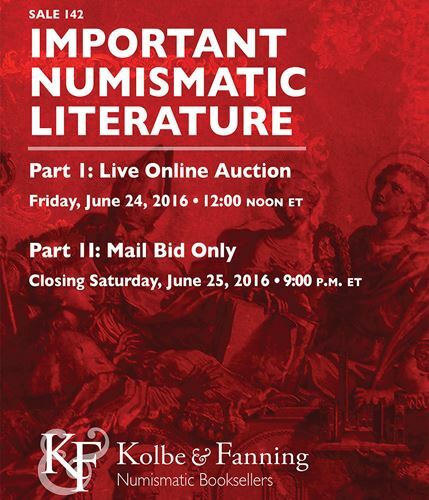 Kolbe & Fanning are pleased to announce their 142nd sale of important numismatic literature will be held on June 24 and 25, 2016. The two-part sale will feature a number of rare and desirable works on ancient, medieval and modern coins from several consignors. The sale is arranged in two parts. The first, featuring 380 lots, will be conducted as a live online sale on Friday, June 24. Bidders may participate in this part of the sale in a variety of ways: in advance via mail, phone, fax or email—or on the day of the sale through their live bidding platform at auction.numislit.com. Register in advance, browse lots and place bids at your leisure: all lots in the first part are illustrated in the online catalogue. Live bidding will commence at noon eastern time on June 24. The second part of the sale features over 600 lots of numismatic books, periodicals and catalogues from around the world, and will be conducted as a traditional mail-bid sale (no online component). This second part of the sale will close at 9:00 pm eastern time on Saturday, June 25. Bids may be placed via mail, phone, fax or email; bids will be treated as limits and reduced as competition dictates. Lot 376: three original volumes of the American State Papers on finance, containing much numismatic information. The sale also offers, split between both sections of the sale, an extraordinary run of George F. Kolbe catalogues in hardcover format, including nearly every hardcover Kolbe sale. A PDF of the 142nd sale of important numismatic literature has been posted at their website numislit.com. 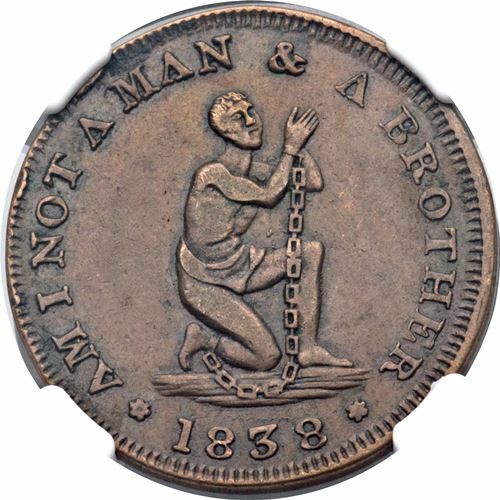 Heritage auction offer an example of the famous "Am I Not a Man and a Brother" Hard Times token, graded XF40 by NGC as a part of our June 10 & 12 Long Beach Expo Tokens & Medals Signature Auction, Just four examples of this token are known. The other three specimens are the John J. Ford, Jr. example also in a major private collection, the Don Miller piece that is now in an advanced Long Island Collection, and the granular example that was recently discovered in Canada. The John Ford example in the June 2004 offering of his Hard Times tokens was graded Extremely Fine and it realized $71,875 at that time. The Ford and Newman coins are virtually identical. Heritage are unaware of the grade of the Don Miller example. Graded Fine Details with environmental damage, the Canada discovery piece was offered in the September 2011 Stack's-Bowers sale where it realized $37,950. These tokens are patterned after late 18th century British Conder tokens. A similar token, Low-54, has a kneeling female figure and the inscription "Am I Not a Woman and a Sister"; those tokens are relatively plentiful. The Low-54A rarity is thought to be a pattern issue. This attractive olive and chestnut-brown piece has exceptional surfaces with trivial rim bumps visible only under magnification. This important rarity, destined for a specialist's cabinet, represents an extremely important opportunity as many years can pass between appearances. For more information, you can visit; June 10 & 12 Long Beach Expo Tokens & Medals Signature Auction.